The Leading Catamaran Boat Cruise Company in Manuel Antonio, Costa Rica. 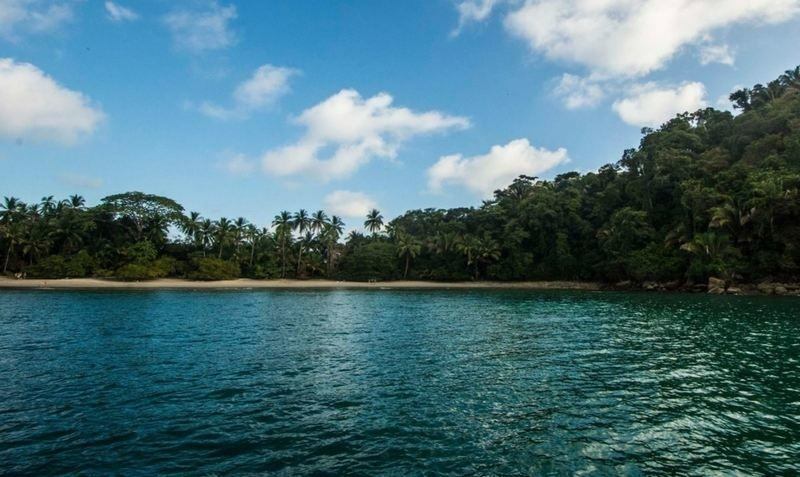 Looking for the Best Catamaran tour in Manuel Antonio, Costa Rica? 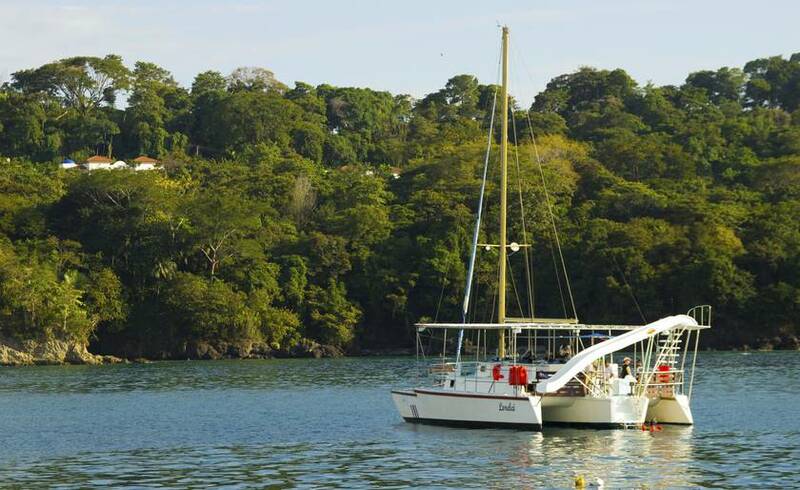 Our company Catamaran Manuel Antonio offers the most complete Catamaran tour in Manuel Antonio, Costa Rica where you can enjoy snorkeling in the beautiful reef of playa Biesanz and Dolphin Watching around the rich coast of Manuel Antonio National Park. We have been doing the catamaran tour for more than 17 years in Manuel Antonio, Costa Rica. 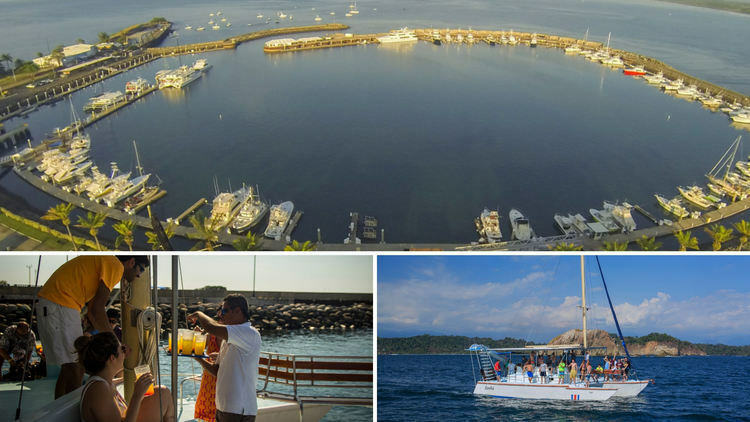 We invite you to join our All Included catamaran coastal tour and enjoy a unique view of Manuel Antonio, plus unwind and enjoy a fun day out at sea. 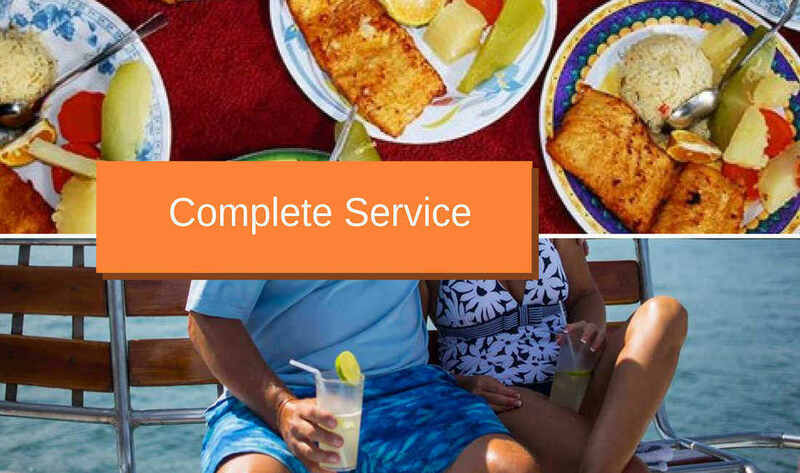 We will provide you with a delicious meal, refreshing drinks, fresh fruits, snorkeling gear, round trip transportation, and the largest selection of boats ranging from the catamaran, sailboat and trimaran. 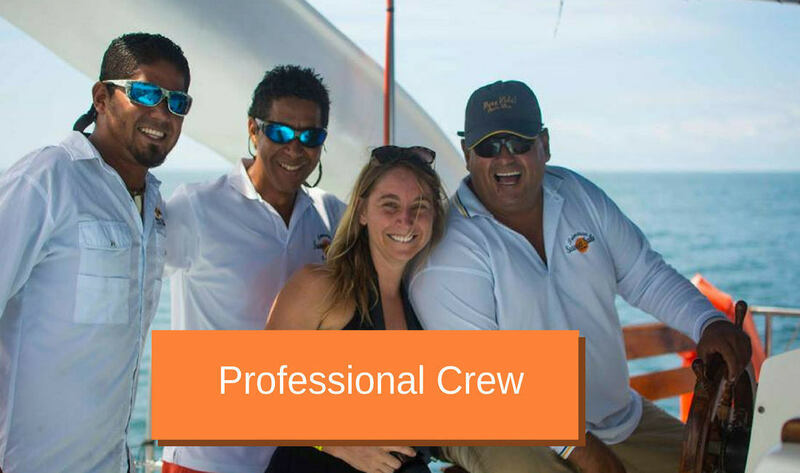 In addition, we also have a professional and bilingual crew to answer all of your questions during the catamaran excursion. You have the option of booking a Morning Catamaran Tour or an Afternoon Sunset Sailing Cruise. 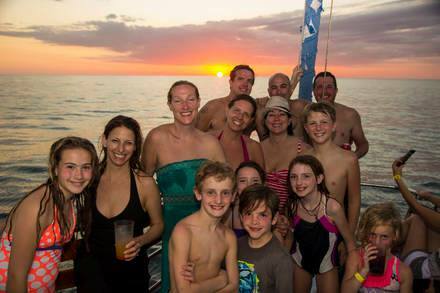 Our regular Catamaran Tour provides an affordable low price per person. You share the boat with other guests. Its a great way to meet people who are also vacationing in Manuel Antonio, Costa Rica. The total length time of each tour is 4 hours. The morning cruise is very popular from May all the way through the end of November because these months are considered to be rainy season here in Costa Rica and the morning time will often be very Sunny while the afternoon might come with some rain. We do want you to take this into consideration when choosing to book either the morning or afternoon sunset tour. From December through April the Sunset Afternoon Catamaran Tour is the most popular because during this time we don`t get rain in the afternoon. In fact, those months are considered to be Summer Time here in Costa Rica. Read More About Morning & Afternoon Cruise. This was one of the highlights of our vacation. My 12 year old son loved the water slide on the back of the boat. One of the aspects of this tour that we loved was the food and drinks served during the cruise. The food is fresh fish or chicken, cooked rice, and fresh vegetables, everything is prepared on the boat which makes it even better. They had a large variety of drinks all of which were delicious. 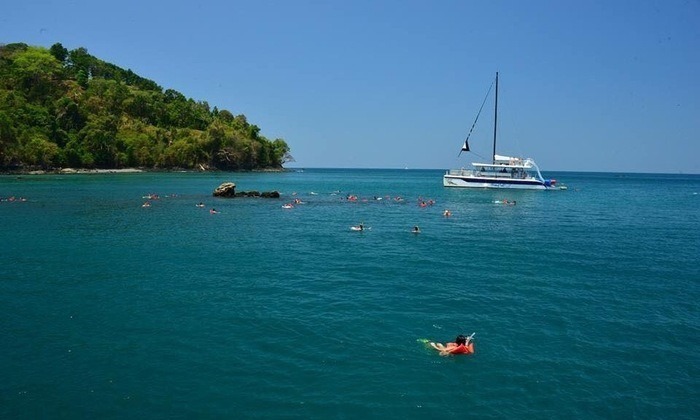 We highly recommend Catamaran Manuel Antonio. You wont find a team that works harder to ensure you have a great time. I enjoyed the beautiful scenic views of Manuel Antonio and seeing dolphins was a first for me. Snorkeling was a blast, they provided the equipment which was great. I will be back soon. Thank You. Great day at sea with Catamaran Manuel Antonio. This is my second time on the catamaran cruise and it won't be my last. Thank you to Mandel for making the reservation quick and easy. Went on the morning trip and saw a large school of dolphins and turtles. Loved the fresh cooked fish for lunch and the calpiriñas served on the boat are great. Definitely something you will enjoy. Staff was very professional, snorkeling was canceled due to high tide but besides that the trip was awesome and we saw dolphins too!. Beverages included were very good with plenty options, lunch was superb, this tour is totally recommended. Catamaran Manuel Antonio provides you with the most diverse options of boats which include a Catamaran, Sailboat and Trimaran. All of our Boats provide a lot of comfortable places for you to sit and enjoy viewing the entire rich coast of Manuel Antonio. 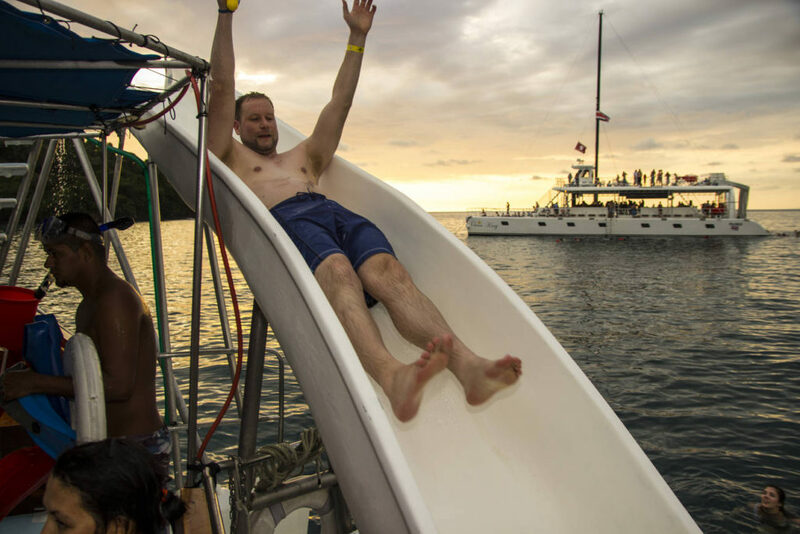 The trimaran and catamaran offer a water slide on the back which is a lot of fun for kids and adults. The waterslide gives the tour an extra dose of adrenaline and a chance to jump in the tropical waters of Costa Rica. The Sailboat is a favorite amongst those who seek the true sailor experience. It is a 56 ft Sailboat which a beautiful blue color haul and it was built perfectly to explore the coast of Manuel Antonio. The catamaran tour starts by us picking you up at your Hotel or Villa and bringing you down to our office located at the Marina Pez Vela in downtown Quepos. If you have your own transportation, you can drive to the Marina Pez Vela using the navigational App Waze. Once we have collected the balance payment at our office it is time to make a very short walk to the dock where our crew is ready and waiting for you to arrive. 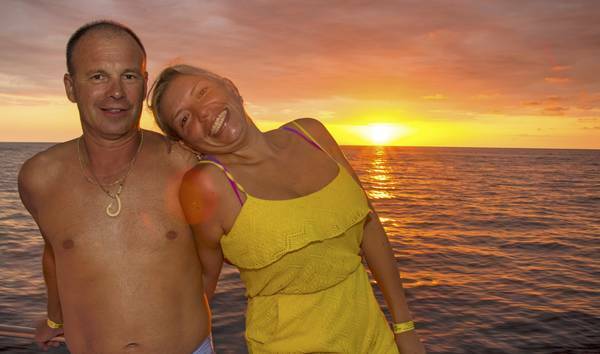 You will be introduced to our Captain and Tour Guides who will be with you during the catamaran tour. A brief safety instruction is provided in both English and in Spanish. Now it is time for us to set sail and start the catamaran cruise around the rich and beautiful coast of Manuel Antonio, Costa Rica. 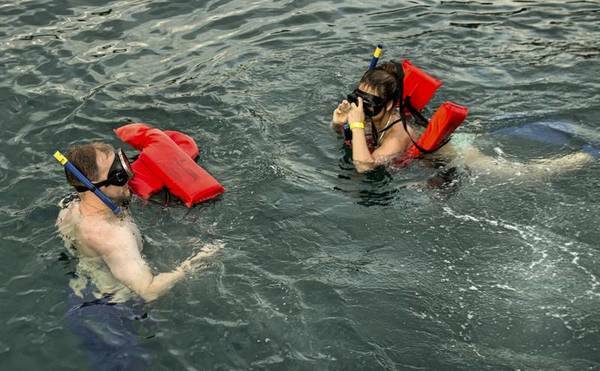 One of the favorite part of the tour amongst our guests has to be going Snorkeling in the reef of Playa Biesanz. 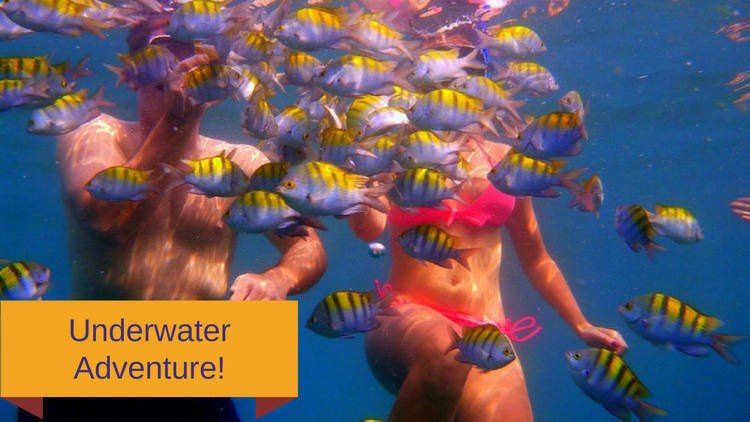 Remember, we provide snorkeling gear for you, so you don`t have to worry about brining your own snorkeling equipment. We have snorkeling gear for Adults and for Kids. Our instructor will provide you with a very brief but very important safety talk about how to properly go snorkeling around the reef. One of our guides will join you on the snorkeling journey to take you to the spots where we have seen the largest variety of small fish. We have some crackers for you to take if you would like to feed the fish, this is a great way to attract the fish towards you and get a close up experience. The fish found in the reef of Biesanz are small in size but very beautiful in their colors. Interacting with the fish and being in the water is going to be a fun adventure for you and when you come back, we will have a complete meal prepared for you. 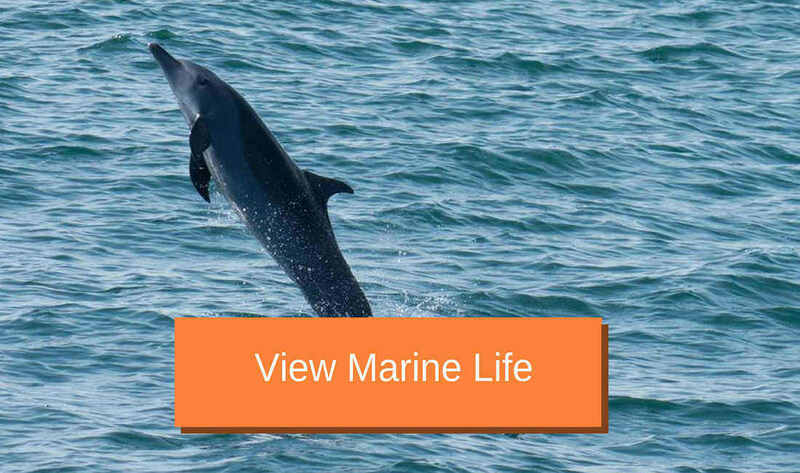 We will be on the look out for marine life such as dolphins, turtles and even Whales. It is important to note that Whales are most common from end of July to end of October. However, the dolphins can be found year around. Also flying around are a lot of birds such as the Brown Booby and Magnificent Frigatebird. These birds are considered pelagic because they spend most of their time flying over the ocean while spending very little time on some small islands which are also visible during the catamaran tour. We try our hardest to make sure you are happy and comfortable during the entire catamaran cruise which is why we try to keep a relaxed and joyful environment on the boat. Our guides are always making sure you have a drink and are there to answer any of your questions. Being out on the ocean will allow you to take in all of the beautiful scenery of Manuel Antonio which is sure to impress. From the boat, you get a unique point of view of Manuel Antonio which allows you to see all of the dense jungle areas plus several of the small islands. We will take you around the beaches of the Manuel Antonio National Park. Puerto Escondido is the name of one of the three beaches inside the National Park and it can only be accessed via Boat which is great for you because you will be on our catamaran cruise, allowing you full access to view Puerto Escondido. The Food & Drinks on our Catamaran Tour. Another favorite amongst our guests is our food and drinks. 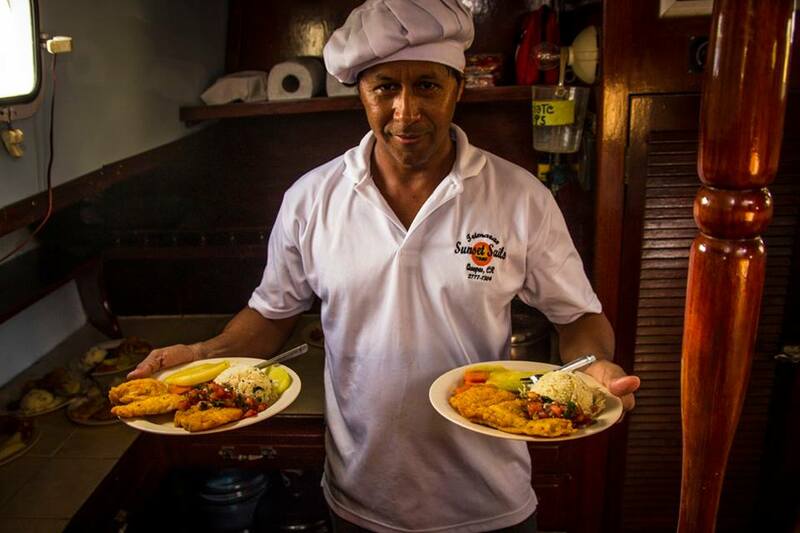 We serve everything fresh and prepared on the boat the day of your tour. We serve fresh fish or chicken with delicious rice and vegetables. Our drinks are very tasty cocktails and we have a wide variety for too choose from. The food is prepared by our chef and he uses only the best ingredients to make the fish, rice and vegetables. We guarantee you that you will find our food and drinks to be very tasty. The staff of Catamaran Manuel Antonio is here to make sure you are happy and having a lot of fun during the entire catamaran tour. We have bilingual guides who speak both Spanish & English and are there to assist you with anything that you need or answer your questions. Our Staff is very knowledgeable about the area of Manuel Antonio and about the different islands, and marine life that is found in near the coast. Our regular shared tour is where you go with other guests but we also provide a Private Catamaran Coastal Cruise for all of our boats. You can do the Private Catamaran Tour for both the morning and afternoon sunset cruise. Included will be the same as our regular shared catamaran trip but the difference is that this will only be you and your group so you get a more one on one personalized service. We are flexible to you the client, so if you wish to book one of our boats for a private cruise it can be for a Birthday, Bachelor Party, Wedding Celebration, and the list goes on. Tell us what you have in mind for the Private Catamaran Tour and we will be happy to assist you in making it happen. The various catamaran cruises feature a variety of comfort, food and activities. But one thing, which they all share in common, is that they all offer the comfortable boat ride, that only a wide, multi hulled boat, can provide. Stability is just one advantage of these Catamaran tours. These beamy yachts can also accommodate activities, such as water slides, sun bathing and even dancing, for those who like to party. “Sunset Sails” is known for their delicious full course meals, which they serve on both of their boats. On their Morning Tour, they serve lunch, and on their Sunset Cruise, it’s dinner. We recommend that you don’t make any other dinner plans, as you probably won’t have room for another bite, until breakfast. The generous portions of their delicious fresh fish meals are a great added value to your cruise, and would cost upwards of $20 in a restaurant. 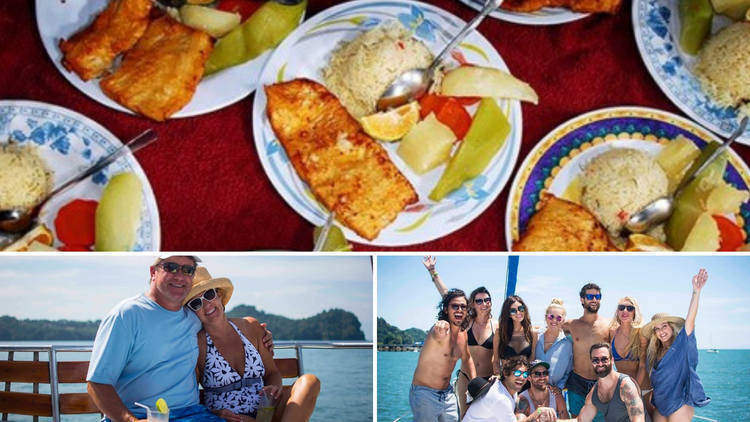 Most of the various Catamaran Tour companies offer food, however Sunset Sails takes great pride in the quality, and plentiful portions of their full course meal. .
A coastal tour around the shores of Manuel Antonio is a very popular activity and with good reason. 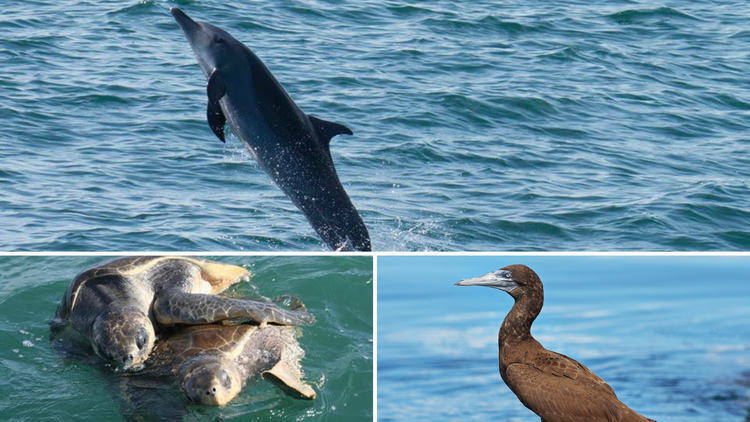 Whether you choose the morning tour, for the better snorkeling in the tropical waters of Manuel Antonio, or the afternoon tour, to view a Beautiful Sunset, you always have a great chance to see Dolphins jumping, or swimming in the boat’s bow wake. Our service specializes in boating activities here in Manuel Antonio, Costa Rica. With over 17 years of boating and tourism business here in Manuel Antonio, we will make sure that you don’t have to worry about finding the best fun and relaxing boat tour.